Sausalito has long been a center for artists of all kinds, with creativity blooming against the backdrop of the bay. Held at Sausalito's Cavallo Point this weekend, the Sausalito Film Festival pays tribute to that artistic spirit, with 14 films over two days addressing a range of topics. Among the lineup is Jane's Journey, a documentary about celebrated anthropologist Jane Goodall. Known for her work with chimpanzees, Goodall has dedicated her life to studying and preserving wildlife. The film follows her through various countries, and includes private footage from the Gombe National Park in Tanzania where Goodall first began her research. Another featured film follows a rather different public figure as he interacts with the environment. 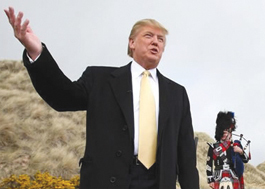 You've Been Trumped (above) tells the story of a Scottish community that fought Donald Trump's plans to turn a stretch of fragile coastal land into a golf course. As the fight between the citizens and the tycoon unfolds, the cultural differences between the two are underscored. For the diehard, the festival offers a bay cruise, as well as opening-night festivities and a special secret showing of a mystery film. The Sausalito Film Festival is held Friday, Aug. 19, and Sunday, Aug. 21, at Cavallo Point, Sausalito. Showtimes vary. $10-$50. 415.887.9506.